1 A None No Power Seat 1 A is a standard Business Class seat that may have slightly restricted legroom due to the bulkhead. There is no floor storage for this seat during takeoff and landing. The proximity to the lavatory and galley may be bothersome. 1 B None No Power Seat 1 B is a standard Business Class seat that may have slightly restricted legroom due to the bulkhead. There is no floor storage for this seat during takeoff and landing. The proximity to the lavatory and galley may be bothersome. 1 E None No Power Seat 1 E is a standard Business Class seat that may have slightly restricted legroom due to the bulkhead. There is no floor storage for this seat during takeoff and landing. The proximity to the lavatory and galley may be bothersome. 1 F None No Power Seat 1 F is a standard Business Class seat that may have slightly restricted legroom due to the bulkhead. There is no floor storage for this seat during takeoff and landing. The proximity to the lavatory and galley may be bothersome. 10 A None No Power Seat 10 A is a standard Economy Class seat that has limited recline due to the Exit Row behind. 10 B None No Power Seat 10 B is a standard Economy Class seat that has limited recline due to the Exit Row behind. 10 C None No Power Seat 10 C is a standard Economy Class seat that has limited recline due to the Exit Row behind. 10 D None No Power Seat 10 D is a standard Economy Class seat that has limited recline due to the Exit Row behind. 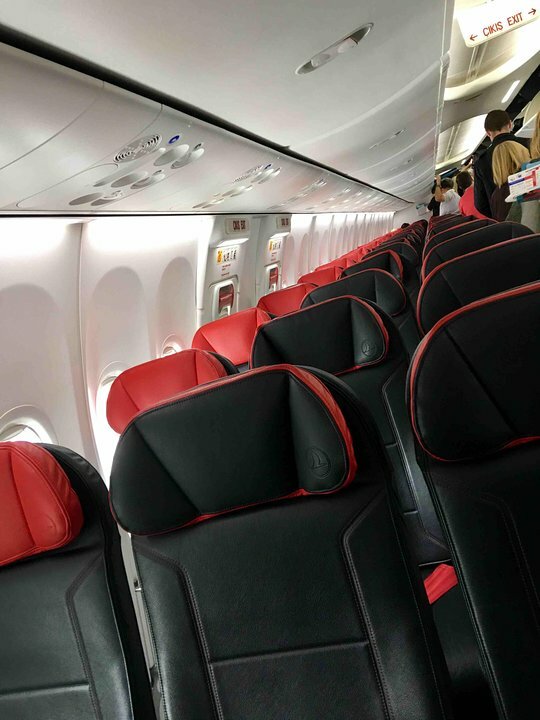 10 E None No Power Seat 10 E is a standard Economy Class seat that has limited recline due to the Exit Row behind. 10 F None No Power Seat 10 F is a standard Economy Class seat that has limited recline due to the Exit Row behind. 11 A None No Power Seat 11 A is a standard Economy Class seat that has additional legroom, but has limited recline due to the Exit Row behind. There is no floor storage for this seat during takeoff and landing. 11 B None No Power Seat 11 B is a standard Economy Class seat that has additional legroom, but has limited recline due to the Exit Row behind. There is no floor storage for this seat during takeoff and landing. 11 C None No Power Seat 11 C is a standard Economy Class seat that has additional legroom, but has limited recline due to the Exit Row behind. There is no floor storage for this seat during takeoff and landing. 11 D None No Power Seat 11 D is a standard Economy Class seat that has additional legroom, but has limited recline due to the Exit Row behind. There is no floor storage for this seat during takeoff and landing. 11 E None No Power Seat 11 E is a standard Economy Class seat that has additional legroom, but has limited recline due to the Exit Row behind. There is no floor storage for this seat during takeoff and landing. 11 F None No Power Seat 11 F is a standard Economy Class seat that has additional legroom, but has limited recline due to the Exit Row behind. There is no floor storage for this seat during takeoff and landing. 12 A None No Power Seat 12 A is a standard Economy Class seat that has additional legroom due to the Exit Row. There is no floor storage for this seat during takeoff and landing. 12 B None No Power Seat 12 B is a standard Economy Class seat that has additional legroom due to the Exit Row. There is no floor storage for this seat during takeoff and landing. 12 C None No Power Seat 12 C is a standard Economy Class seat that has additional legroom due to the Exit Row. There is no floor storage for this seat during takeoff and landing. 12 D None No Power Seat 12 D is a standard Economy Class seat that has additional legroom due to the Exit Row. There is no floor storage for this seat during takeoff and landing. 12 E None No Power Seat 12 E is a standard Economy Class seat that has additional legroom due to the Exit Row. There is no floor storage for this seat during takeoff and landing. 12 F None No Power Seat 12 F is a standard Economy Class seat that has additional legroom due to the Exit Row. There is no floor storage for this seat during takeoff and landing. 13 C None No Power Seat 13 C is a standard Economy Class seat. 26 A None No Power Seat 26 A is a standard Economy Class seat that has limited recline and is in the last row of the plane. The proximity to the lavatories and galley may be bothersome. 26 B None No Power Seat 26 B is a standard Economy Class seat that has limited recline and is in the last row of the plane. The proximity to the lavatories and galley may be bothersome. 26 C None No Power Seat 26 C is a standard Economy Class seat that has limited recline and is in the last row of the plane. The proximity to the lavatories and galley may be bothersome. 26 D None No Power Seat 26 D is a standard Economy Class seat whose proximity to the lavatories and galley may be bothersome. 27 D None No Power Seat 27 D is a standard Economy Class seat that has limited recline and is in the last row of the plane. The proximity to the lavatories and galley may be bothersome. 27 E None No Power Seat 27 E is a standard Economy Class seat that has limited recline and is in the last row of the plane. The proximity to the lavatories and galley may be bothersome. 27 F None No Power Seat 27 F is a standard Economy Class seat that has limited recline and is in the last row of the plane. The proximity to the lavatories and galley may be bothersome. 4 B None No Power Seat 4 B is a standard Business Class seat. 5 A None No Power Seat 5 A is a standard Economy Class seat. However, this seat may have restricted legroom due to the position of the bulkhead. There is no floor storage for this seat during takeoff and landing. The tray table is located in the armrest, making the armrest immovable and slightly reducing seat width. 5 B None No Power Seat 5 B is a standard Economy Class seat. However, this seat may have restricted legroom due to the position of the bulkhead. There is no floor storage for this seat during takeoff and landing. The tray table is located in the armrest, making the armrest immovable and slightly reducing seat width. 5 C None No Power Seat 5 C is a standard Economy Class seat. However, this seat may have restricted legroom due to the position of the bulkhead. There is no floor storage for this seat during takeoff and landing. The tray table is located in the armrest, making the armrest immovable and slightly reducing seat width. 5 D None No Power Seat 5 D is a standard Economy Class seat. However, this seat may have restricted legroom due to the position of the bulkhead. There is no floor storage for this seat during takeoff and landing. The tray table is located in the armrest, making the armrest immovable and slightly reducing seat width. 5 E None No Power Seat 5 E is a standard Economy Class seat. However, this seat may have restricted legroom due to the position of the bulkhead. There is no floor storage for this seat during takeoff and landing. The tray table is located in the armrest, making the armrest immovable and slightly reducing seat width. 5 F None No Power Seat 5 F is a standard Economy Class seat. However, this seat may have restricted legroom due to the position of the bulkhead. There is no floor storage for this seat during takeoff and landing. The tray table is located in the armrest, making the armrest immovable and slightly reducing seat width. 7 A None No Power Seat 7 A is a standard Economy Class seat that is missing a window. 7 F None No Power Seat 7 F is a standard Economy Class seat that is missing a window. Turkish Airlines offers a wide variety of radio stations and audio CDs. Each seat is equiped with a personal TV with Audio and Video on Demand. Turkish Airlines serves complimentary meals, alcoholic beverages, and soft drinks. This version of the Boeing 737-800 has 151 seats in a two-class configuration of Business and Economy. There are 16 Business Class seats and 135 Economy Class seats. Headphones plug into the armrest rather than the back of the seat in front, which keeps them out of the way when eating or letting others out of the row. Horrible 5 Hour trip IST-ADD-IST in a bit wider than Eco businessclass seats, reclining only like in Ecoonomy 5 centimeters. Price 1800 Euro. Never again. All window seats has a electronics box that is maybe 10 cm wide, reducing the space under the seat in front of you. Turkish Airlines flies 3 versions of .